Canyon Ragweed is a member of the Sunflower Family. It grows to 2 feet in height and has green, broadly triangular leaves with toothed edges which grow to 1.5 inches in width. The plant typically grows in rocky soils at elevations below 3000 feet. 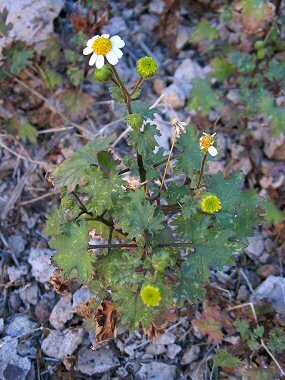 The Rock Daisy at right was photographed in the Eagletail Mountains Wilderness. Emory's Rock Daisy typically blooms between February - May and produces a typical daisy-like flower to 0.5 inches in width.